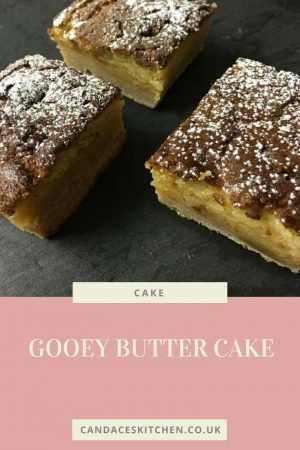 There is nothing more satisfying than spending time baking something yummy and filling for my family and friends, especially when it is something as yummy as this gooey butter cake. I adore cooking for others. Especially if it puts a smile on people’s faces. I’ll happily get involved with catering for other people’s events but only on the condition, others stay out of my kitchen. I am not a fan of other people ‘meddling’ when I’m cooking. Cook do the washing up, oh yes please, but never meddle in the cooking part. I hadn’t spent an afternoon cooking due to our house move for quite a while and it was just what I was craving. I gathered the ingredients together and in an instant, my little helper (daughter) had arrived. It doesn’t take her long to appear if she thinks there is some form of baking going on. Baking with my kids makes me even happier and luckily both of them enjoy cooking. 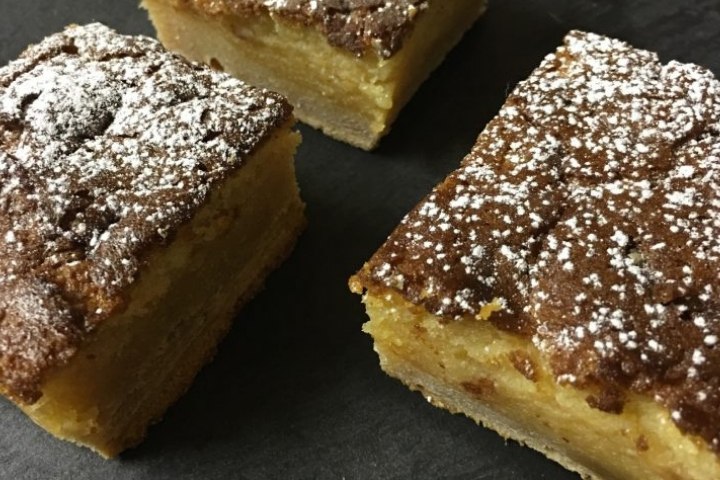 Gooey butter cakes are a none traditional tray bake. The base is a bread dough and the top half is s very buttery cake. This is not a cake for someone on a low fat diet. The word butter in the name is a bit of an understatement for these yummy little bites. The slices are rich and this isn’t a cake you sit and eat in one sitting. For me, that’s great as usually I bake, I blink and the kids have eaten it all. I know with this cake they’ll be another slice for the next day. I’ll start by saying this gooey butter cake is not one you can whip up in 10 minutes. It takes a few hours but sometimes it good to take time and create yummy goodness. Grease and flour a 23 x 32 cm loose bottomed tin. In a saucepan gently heat milk, water and butter. Then add the yeast. In a separate bowl mix together the flour, sugar and salt. Add the liquid mix after 10 minutes. Using an electric mixer, preferably with a dough hook mix for a couple of minutes. Scrap the dough down the bowl and mix for a further 10 minutes. Push the dough in to the baking tin. Place somewhere warm whilst you prepare the butter cake mix. Add half of the condensed milk and whisk for a further 5 minutes. The cake batter will still be a little spongy to the touch. Don’t worry it will stiffen up once cooled. What I have found with this cake is it tastes best if left for 12/24 hours as the butter in the topping soaks into the dough. This cake should never be eaten warm. Sometimes s slight less warm co cake can taste so much better than a cooled cupcake but not with this cake. The topping can be greasy due to the amount of butter used so take my advice and be patient, you won’t regret waiting with this slice of goodness. Good lord, get that in my belly!!!!! Wow, these look amazing! I’m a huge fan of tray bakes, and an even bigger fan of condensed milk, golden syrup and butter! This is a new one on me and it looks and sounds totally delicious – will have to try it out so I can have a taste! I second Emma’s sentiments, maybe me and Emma can come up to your house and have a slice of your delicious cake?! 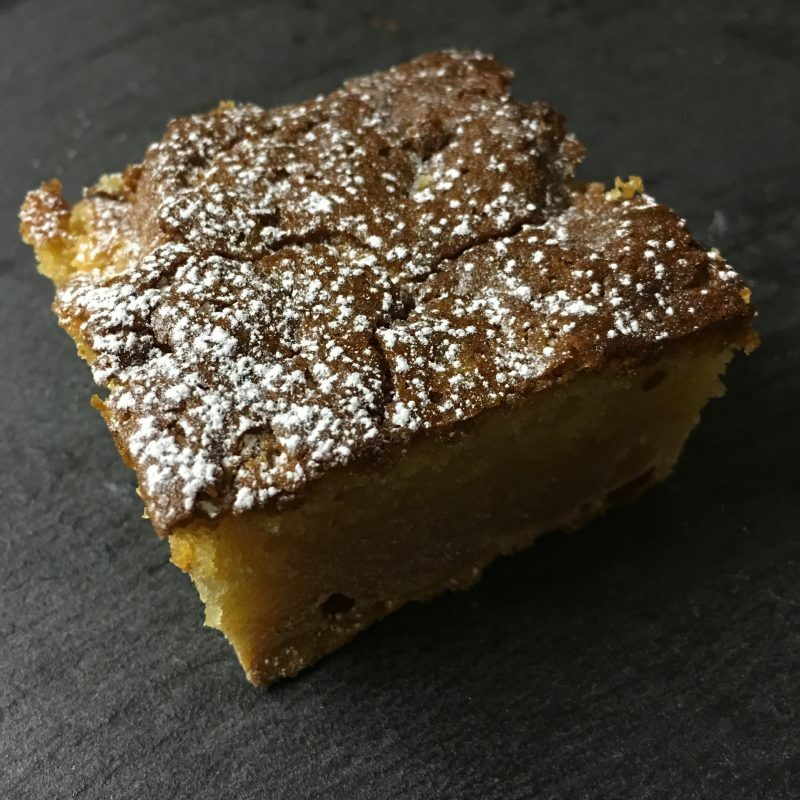 Butter cake is found in a select few bakeries in Philadelphia and possibly south jersey still. Recipe seems spot on with others i have found. I’d never heard of this type of cake before. The recipe seems easy to follow. I might give it a go! MMM looks lovely, I love golden surupy things. Only prop Lemnos you said this takes time to make – I think I need this now #PregnancyCravings – can someone please bring me some? I’ve never tried butter cake, had never even heard of it! I’m trying to imagine what it tastes like but can’t quite get there 🙂 I’d say it’s delicious though and I love anything with butter so I’d probably really enjoy this one. I’ve never heard of butter cake but these babies look like what I love to have with a strong cuppa! I haven’t eaten a butter cake in years. My Gran used to bake them quite a lot though so they’re full of lovely memories for me. I am going to have to try out this recipe soon, thanks for sharing Candace.